This is my Bloodstained Mire. Looks pretty good, right? It’s Onslaught, pretty good edges, no real…wait. Yup. That’s a bend. It’s not even an inch long but it’s enough for Star City Games to have marked it as ‘Damaged’ and sell it to me for about 50% of retail value. At the time, about three years ago, the Mire was $40 or so and I bought this for $20 for a Commander deck. I remain quite pleased with this decision, and I’m going to encourage you to do the same. The more that a card is marked, the less it is worth, since it’s no longer perfect, or close to that. Mint is a rarely found card condition, so Near Mint is what we mostly aspire to. Cards don’t always exit the pack as Mint condition, due to being off-center or slightly discolored. While it’s true that those cards which are Moderately Played or Heavily Played are worth less in a retail setting, they remain the actual card and you cannot lose sight of that. Dual lands are still dual lands, on the reserved list, and there will not be any more of them printed. Even if they are messed up, they remain a rare card and something that you should want to acquire for the right price. That price can be difficult to ascertain. Star City used to have displays with their damaged cards, cards which they didn’t list on their website because scans of each and every card is just not worth the time, aside from the most expensive ones like pieces of Power. I haven’t been to an SCG Open in years, mainly because I live on the West Coast and they don’t bother, unfortunately. Value or Budget – Look, we aren’t all big spenders. 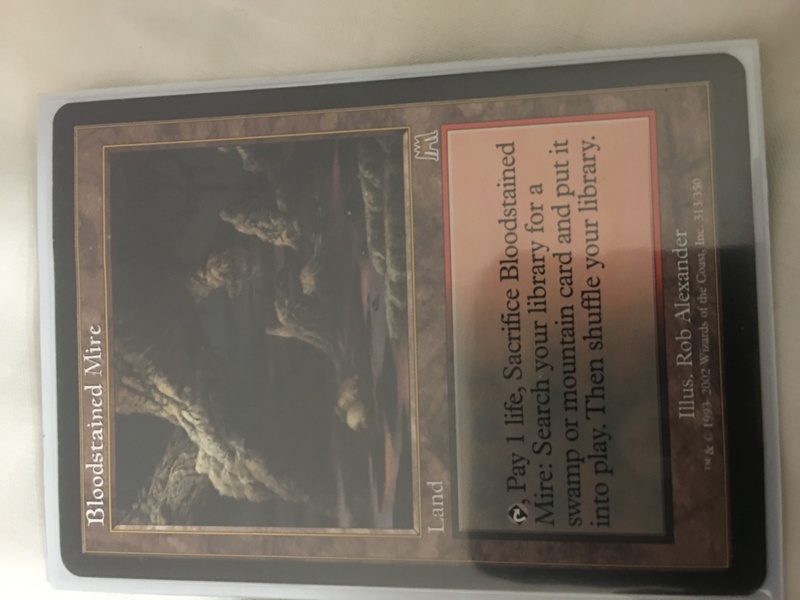 MTGPrice is not here to only for those who wish to spend several thousand dollars on speculative buys. We are also here for those who wish to stretch their budget on cards, and damaged cards may be the best way for you to do that. 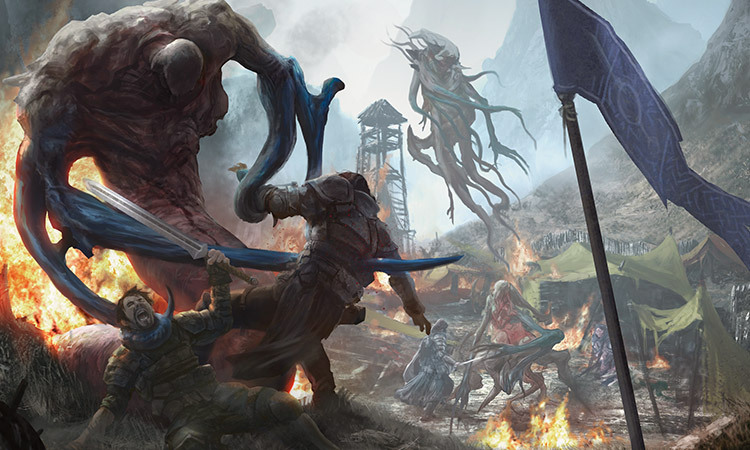 For instance, if you have a large selection of Commander decks, you may get tired of paying full price on things over and over again because they are just so awesome in so many decks. How many Mikaeus, the Unhallowed do I need to trade for, after all? The lands needing to get moved around is especially egregious, and that’s why I got the Mire, to be in a second deck. Trade Bait – This is about honesty. You’re going to buy a card that grades as damaged and yet is still very useable…just not for you. So when you keep this flawed card in your trade binder, you can have something that people want to trade for, but be honest with them about the condition. There are a lot of people that are going to want this card and will trade you at a surprising amount of value. People build a lot of cubes and decks and don’t necessarily want to break the bank in order to get the cards they want. Using played/damaged cards is perfectly acceptable in a lot of groups, especially for rarer cards that are now twenty years old and exceedingly difficult to find in near mint condition. When you acquire a damaged card, I implore you to not try to get every cent you can out of someone when you’re trading it away. Be realistic and be friendly, because that person will likely take more than one of your damaged cards. Having an out for such things will be very useful. Finally, don’t be afraid of picking up a half-price old card because those older cards are surprisingly in demand, no matter condition. The “old-school” format of 93/94 and the collectors of Alpha and Beta are seriously warping the environment. Beta Chaoslace is $40! Condition really matters when you want to max out on a card’s value, just think of Moxes and Library of Alexandria and such. There are a lot of times, though, where acquiring a beat up version of something is preferable. Keep an open mind! I also noticed that ‘damaged’ can mean a lot of things. It’s never clear what exactly damaged means, and if an expensive card is rated as damaged it is often a good idea to ask why and, if possible, ask for a scan or a photo. There are some real bargains to be made. 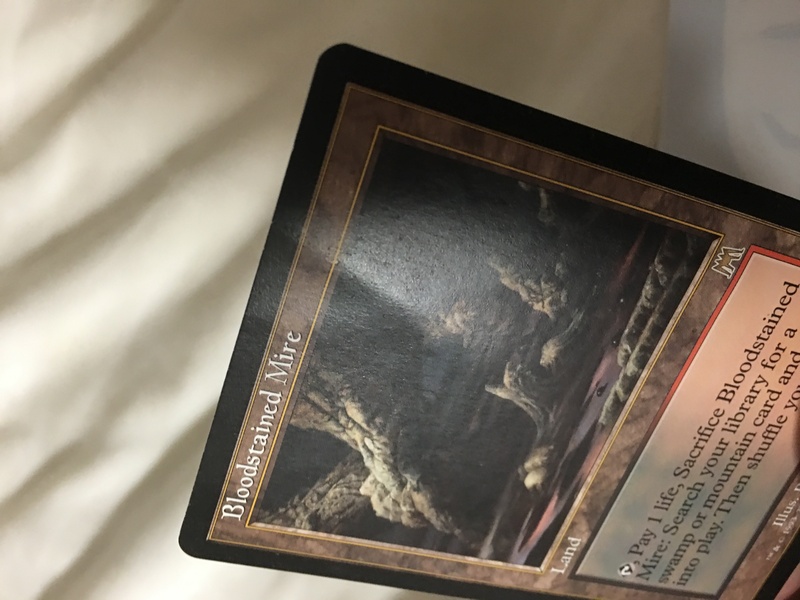 I bought a damaged Mishra’s Factory (Summer) for $5 since the seller sold it stating that the card had a bend and was looking good otherwise. 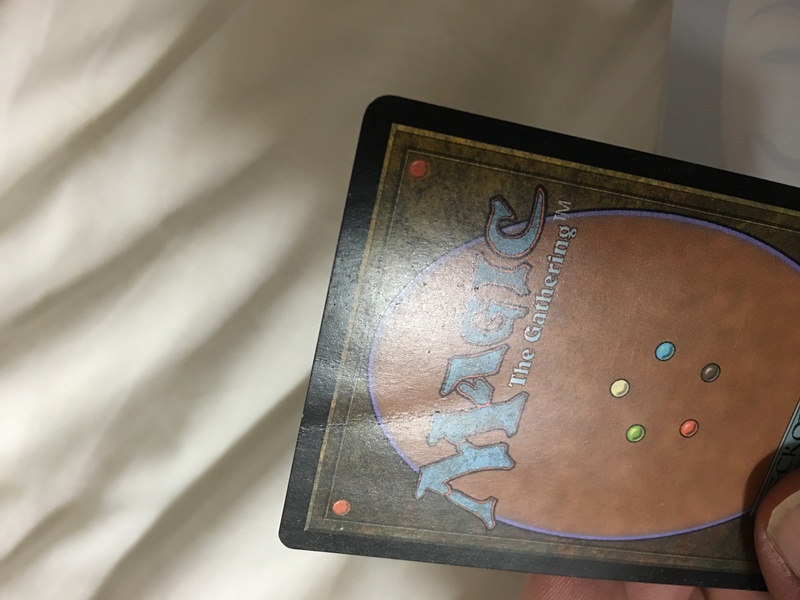 Turned out to be a near mint card with a tiny bend in the upper right corner that is impossible to see unless you examine the card very closely. Also bought a Strip Mine (even horizon one) for $2. Card was heavily played and had some very visible clouding on the back, but the front looked great (no clouding at all), only the edges had a lot of wear. In a sleeve it still looks very nice, and it cost only 20% of a lightly played copy. Personally I wouldn’t care much about card condition anyway if it wasn’t for the actual monetary value and if I wouldn’t also see them as an investment. I think that lightly/moderately played cards look better than mint cards. Especially the old school cards I like to play with. Weird, I know. But that’s how cards looked back in ’94. They tell a story and look like someone has really played with them unlike those shiny, mint museum pieces. Well said. I love a weathered look on old cards. Whenever I find a cheap beat up copy of a card from fallen empires and earlier, I trade or sell my NM version and pocket the difference. It’ll hurt if I ever sell my collection someday but by the time that happens MTG might be yesterday’s fad. And all the cardboard, minty or beat up, will be worth whatever the recycling center is paying for paper. Damaged are the best. That’s how I have a sharpied boardered Revised Underground Sea, beat to hell Revised Bayou, the yellowist badland that looks like a smoker’s lung, and once sticky foil steam vents that I took to the bathroom, carefully dabbed the stain and doubled the value of what I’d just paid. They’re all so beautiful and work just fine sleeved up. I agree. Here’s an experience I had…I could get a gold bordered Force of Will for around $18 to $20. I just wanted one copy for my EDH deck. Then i spotted a sharpied black border Force of Will on eBay. Some enterprising soul chose to sharpie the gold border then sell it. I paid $9. In a sleeve, no one is the wiser it’s not the real $80+ version of the card instead of being a championship deck card. You really can’t tell it’s sharpied at all. I was impressed and it looks so sweet when it comes out into play! That card is illegal in tournament play. I don’t think that this site should condone practices that can get someone banned from tournaments. Not everyone plays in tournaments… The author even mentions Cube players and casuals. Seems asinine to stifle information just because something isn’t tournament legal. The most recent damaged pick ups for me were from GP Madison Foriegn and Damaged Mishras Factory(Italian) summer, Urzas Power plant(chineese) the red rods, Vise Rack(italian), Anowan the Ruin Sage(Japanese), Phyrexian Crusader (Japanese). All light white on the edges all 100% fine once sleeved. AI got them all for $1 each from that box that day. Though I wish I went earlier as friend got a play set of swift spears.